Counts quickly and accurately – Counts up to 1,500 bills per minute while eliminating any doubt in the correctness of the count. Defends against counterfeits with ultraviolet and magnetic ink detection systems. Any potential counterfeit bills are clearly displayed on the large LED screen. Advanced infrared detection ensures an accurate count every time. Catches any chain, double or half note issues. Includes Automatic, Manual, Count, Add, Batch and Add plus Batch modes for a wide variety of money counting needs. Purchase with confidence: the Ace is backed by a one-year warranty. Quickly and accurately count the money your business generates with the Kolibri Ace Bill Counter! 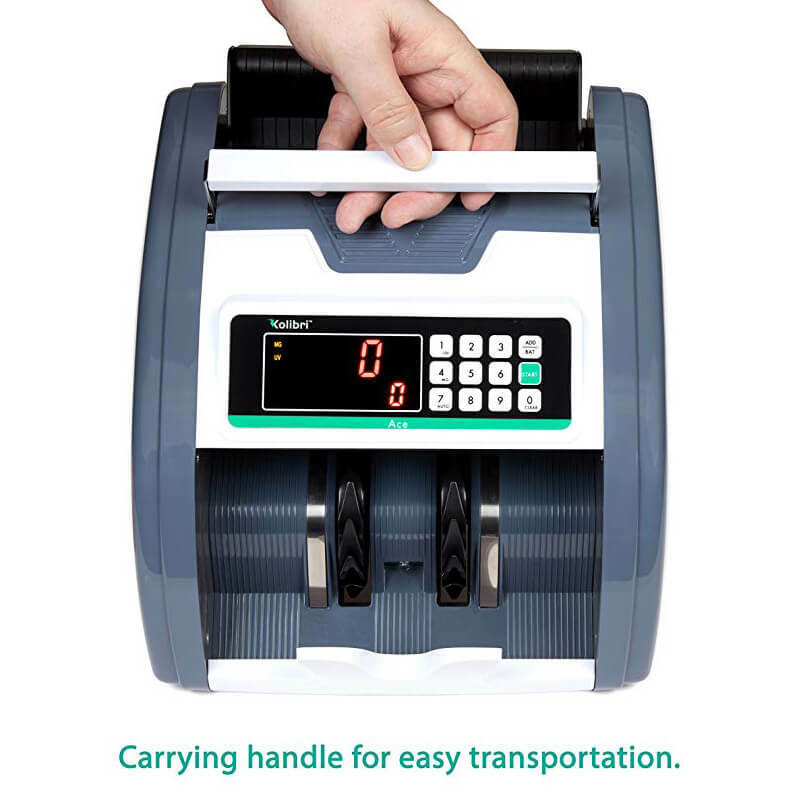 Speed through stacks of cash in no time with its 1,500 bill per minute counting speed. Never worry about the accuracy of a count again as the Ace utilizes infrared technology to ensure each count is correct. While counting, the Ace automatically scans bills with both ultraviolet and magnetic ink detection systems to stop and clearly display on the screen any potential counterfeit bills in their tracks. The Ace can easily switch between Automatic and Manual mode according to your needs and includes 4 operational modes to cover all of your business’s counting needs. The simple Count mode will give a total count of all bills passed through the hopper. Add mode makes use of the Ace’s large LED screen to provide a running tally of all bills counted. Batch mode will count out the selected number of bills to easily separate a stack into the amount needed. And Add plus Batch will separate out needed batches while also keeping a tally of all bills counted. The Ace is backed by a one-year warranty. Where can I buy a bill counter? 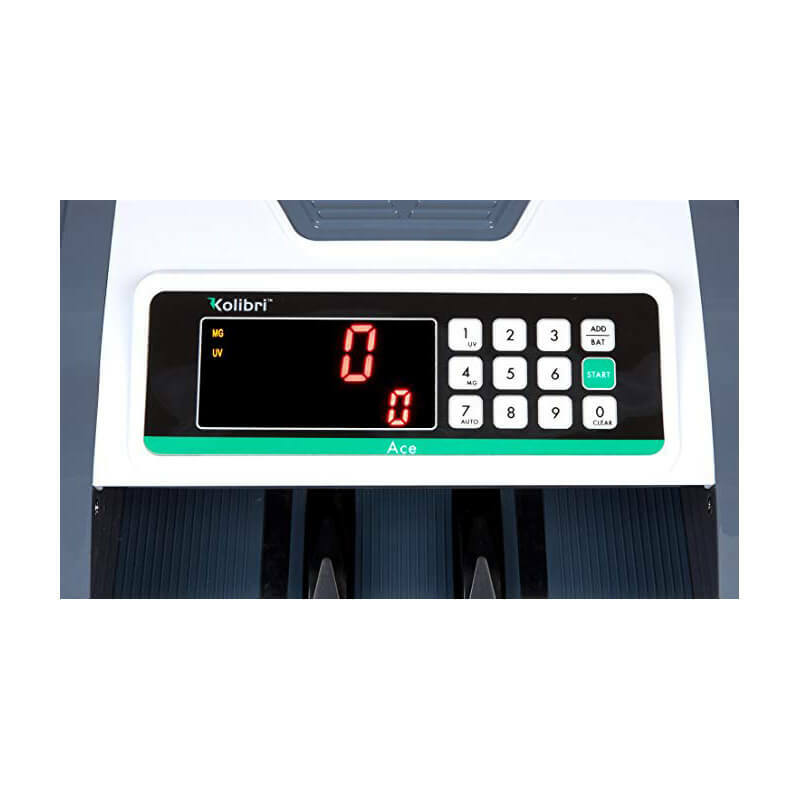 The Kolibri Ace is a premier currency counter that features a high-end counterfeit detector and the ability to accurately count 1500 bills per minute. It weighs 11.3 pounds and its dimensions are 11 x 10 x 7 inches, and it can be ordered online. By clicking the ‘Buy Now’ button on this page, you will be redirected to Amazon.com so you can make a purchase. How does a bill counter work? Bill counters have a stacker where bills (individual or in a stack) are placed. They are then pulled, one by one, through the machine. During this process, each bill interrupts a beam of light within the machine, which is what enables the unit to count the number of banknotes. Units equipped with an UV-based automatic counterfeit detector take advantage of the fact that many countries’ banknotes have fluorescent symbols or writing that is only visible under UV light. This is one of the ways Kolibri Ace is able to efficiently recognize counterfeit bills. Why is an automatic counterfeit detector and bill counter needed? 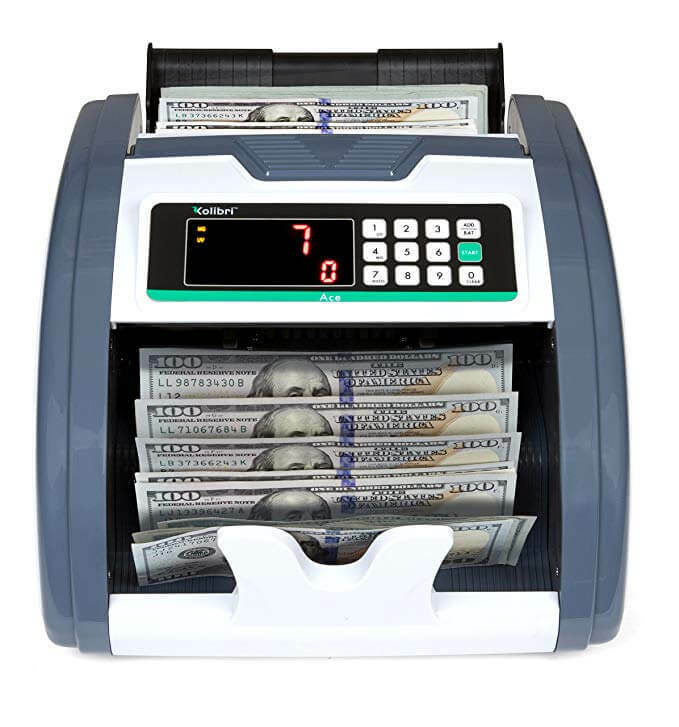 A money counting machine is the fastest and safest way to correctly count banknotes and eliminate mistakes during counting. 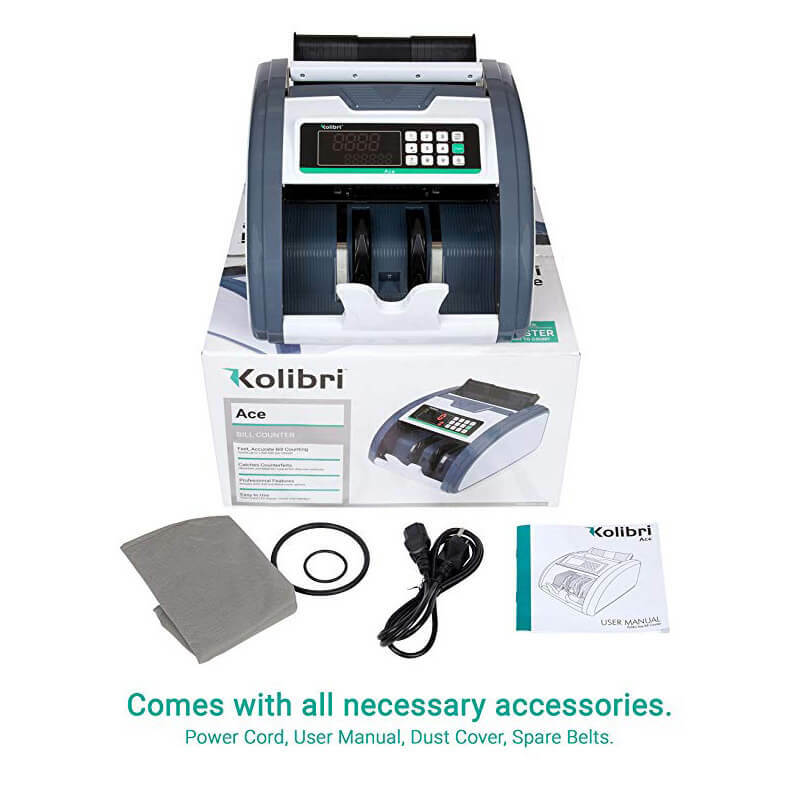 Advanced models such as Kolibri Ace come with an integrated automatic counterfeit detector that utilizes magnetic and ultraviolet ink detection systems to instantly and unerringly catch counterfeit bills. Even if you trust your employees to count every cash deposit perfectly and never make a mistake, having an integrated counterfeit detector is still a must-have technology in this day and age. What is the best money counting machine? 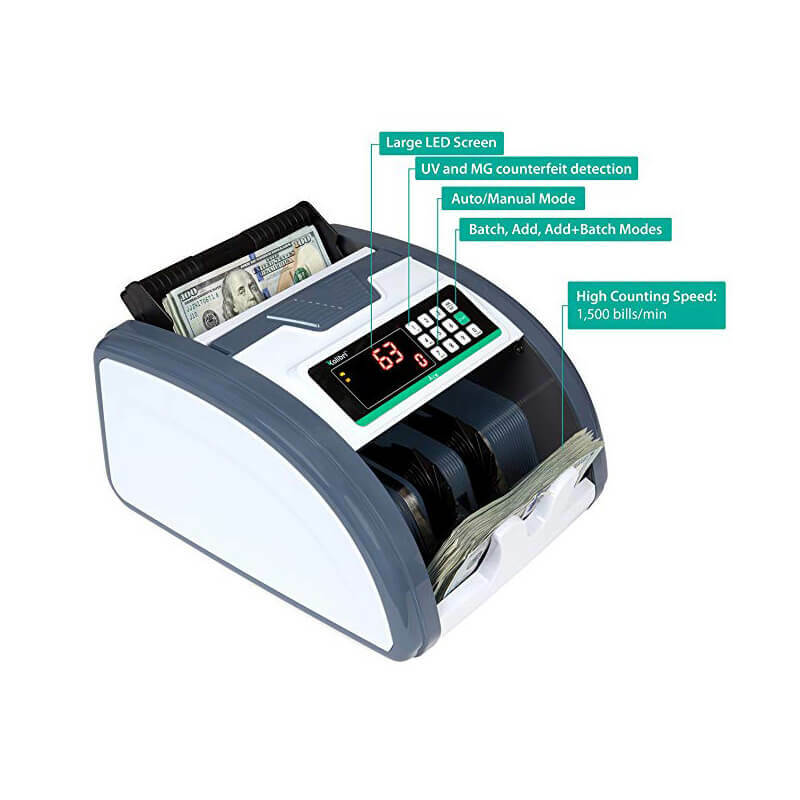 Kolibri Ace money counter and counterfeit detector not only offers unparalleled accuracy and the ability to count 1500 banknotes in one minute, it also comes equipped with magnetic, infrared, and UV detection. The Ace makes your money counting easy and quick, while also protecting your business from the dangers of money counterfeiting. Its compact size, convenient retractable handle, and sturdy build enable you to carry it anywhere you go without hassle or risk of damage. Last but not least, its longevity and quality are further backed with a 1-year warranty. What does the one-year warranty cover? 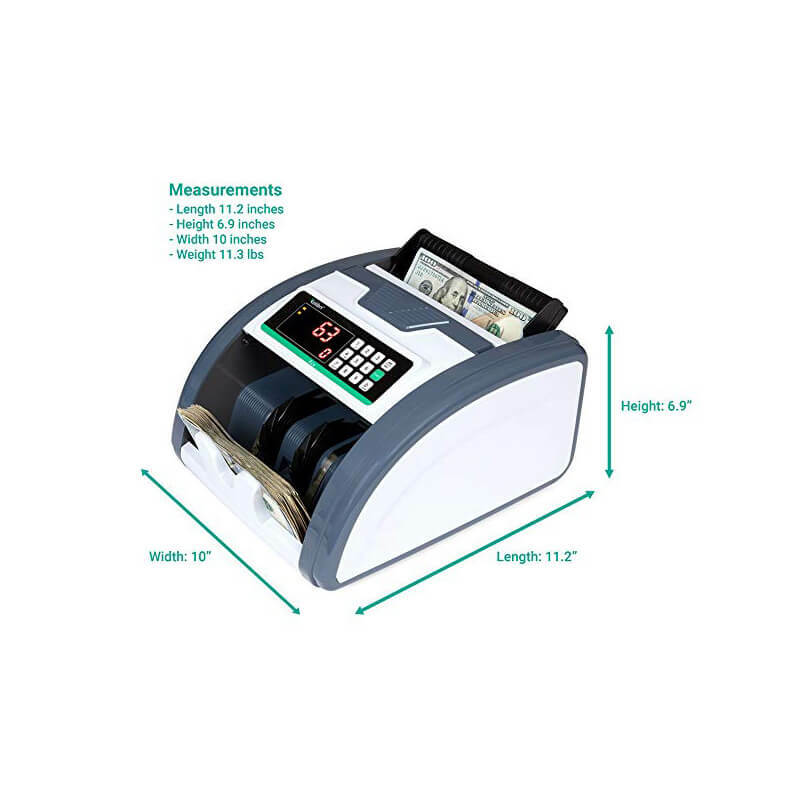 As with the warranty for our Knight money counter and counterfeit detector, the warranty for Kolibri Ace covers manufacturing defects, as well as unit related failures that happen in the course of normal operation while following specific guidelines outlined in the user manual. This warranty does not cover failures and errors that occur as the result of mishandling, improper use, tampering, and unauthorized maintenance. Kolibri is also not responsible for any damage that happens due to spilled drinks, foreign object damage, or improper storing and transportation. Is Ace the only Kolibri product? Not at all. Kolibri offers a range of expertly designed and constructed products that aim to improve your company’s productivity and protect you against potential issues. 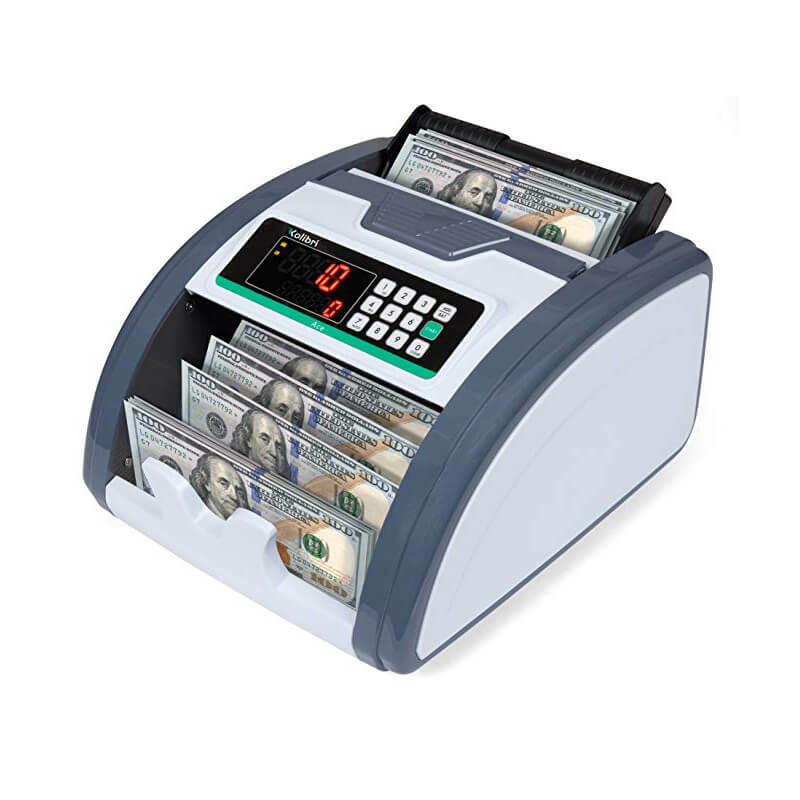 One of our staple products is the Kolibri Signature, a two-pocket business-grade bill counter and sorter equipped with counterfeit detection and the ability to unerringly read stacks of mixed bills. It automatically scans banknotes with both magnetic and ultraviolet ink detection systems to instantly and accurately prevent any counterfeit bills from getting into your system and creating potential trouble for your business down the road. Finally, the Kolibri Signature counts up to 1200 bills per minute and has an additional batch mode that enables you to batch banknotes in units of 10, 20, 25, 50, and 100 bills. To find out more about the Signature and our other products, browse our online inventory, contact us if you have any questions about device functionalities, and order the item that best suits your business needs.